Acid staining is the process of adding color to concrete using a chemical-based stain. When the metallic salts in the acid stain come together with the lime and mineral content in concrete, a chemical reaction occurs, creating special effects on the concrete slab. Compared to water-based staining, using an acid stain requires a longer process since it involves neutralizing and rinsing. There are many factors that could affect the effectiveness of acid stains and one is temperature. There are many reasons why it is better to leave acid staining to the experts. One is the temperature. The temperature of the concrete and the surroundings must not be too high or too low so as not to affect how the stain dries and binds. 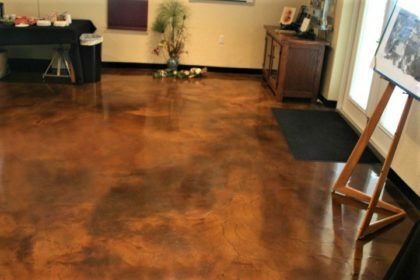 Here are tips to consider when acid staining concrete. The surrounding temperature must be considered not only during installation time but for the rest of its drying time, which is about 12 hours. The proper temperature must be 35 degrees F. It can get higher or lower but as long as it does not get too hot or freezing. The drying time of an acid stain varies on the changing temperature as well. The important thing is that the temperature is within the normal range for a full 24 hours to make sure that the stain penetrates and binds fully in the deepest color possible. But if you are aiming for a lighter color, you can rinse and neutralize after 12 hours. Acid staining is still possible to do during summer. Just make sure that you apply the stain in the coolest part of the day, which is early in the morning. Doing so also ensures that the concrete is at its coolest since it usually releases absorbed heat through the evening. It can get pretty difficult to schedule an acid staining project especially if the weather is erratic and unpredictable. It is important to check weather forecasts to make sure that an unexpected storm or heat wave is not set to happen during installation day, especially for outdoor concrete surfaces. Despite the need to consider temperature, the effort is all worth the results that an acid staining would yield. Once dried and sealed, the exceptional beauty and surprising effects will make any concrete space look more elegant and presentable. All these at a friendly price.